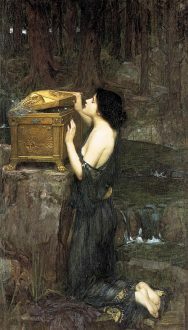 So what is the relevance of the Pandora myth for us today? Not merely in an individual sense — we all have experiences from time to time of a ‘can of worms’ (colloquial for Pandora’s box) being opened in our lives, from something being said inadvertently about our reckless youthful romances in front of a jealous lover, to an impulsive suggestion about fixing a neglected property that needs more (expensive) work than initially thought. But I mean something different, on a collective, national, or even international, global scale. And I can think of quite a few nasty things that have escaped when the lid of Pandora’s jar was lifted, from about a 100 years ago to today. Think of the rise of national socialism in Germany after the First World War, for instance. What initially seemed like a movement that gave Germans a sense of cultural pride, which they desperately needed at the time, given the (economic) price they paid, particularly after the war, turned into a nightmare that brought with it the nameless suffering and death of millions of people, including about 6-million Jews during the ‘Holocaust’ or ‘Shoah’. The Pandora ‘evil’ in this case could perhaps be (partly) described as the hubris or conceit of racial purity and supremacy — something that repeated itself not much later in South Africa in the guise of the ideology of apartheid, which was a milder version of the conceit of racial supremacy, and was accompanied by severe suffering on the part of black people. One could add to these Stalin’s reign of terror in Russia, the totally superfluous Vietnam war, waged because of ideological blindness, the unnecessary war in Iraq, initiated more out of economic expediency than the need to locate and destroy ‘weapons of mass destruction’, and many more – all indicative of the fact that the lid of that infamous jar or box is still being lifted from time to time. “That’s because many companies are returning huge portions of their billions in tax savings to shareholders in the form of share buybacks and dividend increases — not necessarily new hiring and investment. “Companies are on track to plow a record $1-trillion into boosting dividends and buying back their own stock this year, says Howard Silverblatt, senior index analyst S&P Dow Jones Indices. “Buybacks are a strategy to boost stock prices — by reducing the number of shares outstanding, which artificially increases a company’s earning per share. But they do little to improve the economy. “Companies in the S&P 500 have also increased dividend payments to shareholders 182 times so far this year, giving investors greater incentive to buy and hold their shares, according to Silverblatt. “The Trump tax cuts, which slashed the corporate tax rate from 35% to 21%, boosted corporate profits overnight for many big firms. Combined with the new provision that caused U.S. companies to repatriate billions in overseas earnings, many companies are awash in cash. This is but the tip of the iceberg as far as Trump’s Pandora effect is concerned. Most egregious, perhaps, is his total disregard for the preservation of natural ecologies which are vital to the survival of life, manifested in his claim that climate change is a hoax. Yet, the recent fires raging in the Northern hemisphere are an irrefutable sign of global warming. Just think of the effect that his ill-considered directives have had on the attempts, many of them initiated by his predecessor, Barack Obama, to combat the worst effects of global warming and other manifestations of deleterious human impact on nature. Just yesterday I read about his reversal of Obama’s ban on the use of neonicotinoid pesticides in industrial agriculture, which was aimed (by Obama) at safeguarding particularly honey bees, which are vital to the survival of plants because of their cross-pollination function in nature. Here in South Africa the EFF and the ANC have also allowed some ill winds to escape from Pandora’s box in recent times, particularly in the shape of their stated intention to change the constitution and pass a law legitimising ‘expropriation without compensation’ — which is just another name for legalised theft. I recall a time, not too long ago, when the ANC government assured South Africans that South Africa would not ‘become another Zimbabwe’ (under Mugabe, who specialised in land grabs from white farmers for his cronies). Now they have put us firmly on that path. Don’t get me wrong. As often stated in this blogspot, I believe drastic economic measures are needed to reduce inequality in this country, BUT expropriating productive farms owned by whites, and needed for food security at a time when SA is already importing food, is not the way to do it. Taxing billionaires at a higher rate than others, and curbing corruption (and retrieving sums like the R19-billion stolen from Eskom), using that money to create employment, are much more viable options. I recently saw a statistic (the reliability of which I cannot guarantee) indicating that 70% of the farms given to black farmers under the previous dispensation of ‘willing buyer willing seller’ are lying fallow, that is, are not producing food. Yet the governing party, in its blind quest for votes in 2019, is forging ahead with a measure that could sink this beautiful country. Indications are that state ownership of land is extensive — the obvious thing to do then, is to use that land to give to aspiring black farmers. Moreover, if bonded farms which belong to banks are expropriated, will the new owners be able to take over these bonds? Which points to another possible Pandora source of ruin; and if the financial institutions in the country collapse, the scenario sketched by novelist Eben Venter in his novel, Horrelpoot (Clubfoot) is but a stone’s throw away. Unless the ANC abandons the expropriation bill, some more evils could escape from Pandora’s box.